How many of us are terrible guilty of taking for granted the little details in life? I sure am! We live in such a fast paced world where we are continuously running from one thing to the next completely ignorant to the small details. So from today I am going to slow myself down, I’m going to appreciate the cool crisp autumn air, the cosy winter nights.... I am going to focus on being more appreciative and happy. I always forget to appreciate the little things but it's important, isn't it. I'll be taking time out to appreciate good coffee and fresh bedsheets and the likes! I need this printed out and stuck on my wall. 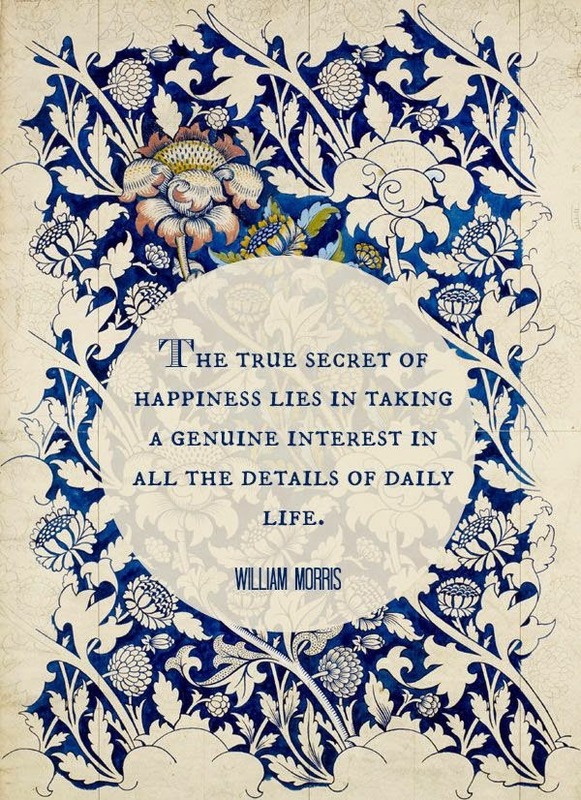 Not just for the quote but because I love the William Morris art work. :P I've recently started writing down three things that make me happy everyday and it forces me to think about the positive things in my life rather than the negatives. I wrote my last blog post on a similar subject. It's so true that we rush through life, jumping from one thing to the next, and miss all those little moments. I've been trying to slow myself down more and appreciate every tiny detail life has to offer and can honestly say that it has made me happier. Thanks for leaving me your blog link on twitter. I have enjoyed reading and look forward to reading more in the future!